At 3:15 p.m. EST, NASA astronaut Tim Kopra assumed command of the International Space Station from astronaut Scott Kelly of NASA in a traditional Change of Command ceremony. Expedition 47 will officially begin under Kopra’s command when the Soyuz spacecraft carrying Kelly and Russian cosmonauts Mikhail Kornienko and Sergey Volkov undocks from the space station on March 1. Watch video of the moment of change of command. Kelly and Kornienko launched to the space station on March 27, 2015, for their one-year mission. The pair’s return on March 1 will mark the end of 340 days aboard the space station. Volkov arrived at the station on September 4. 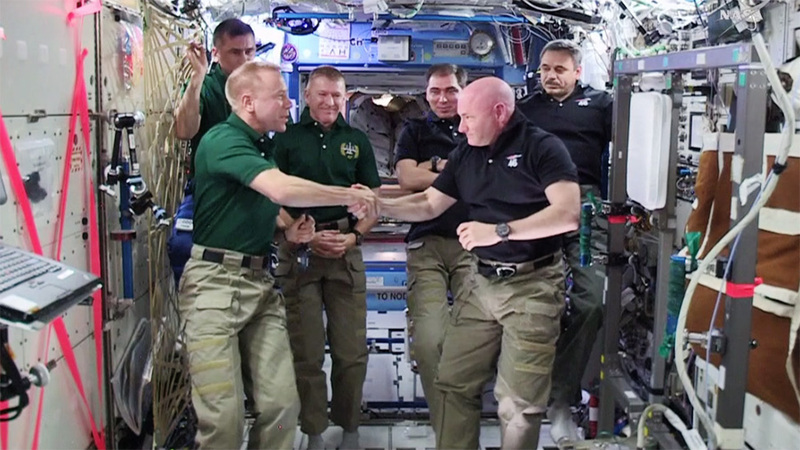 Join the online conversation about the one-year mission using #YearInSpace. Follow space station activities on social media via Twitter, Facebook, and Instagram. To learn more about all the ways to connect and collaborate with NASA, visit: https://www.nasa.gov/connect. Hooah sir ..Aiden in California. Safe return gentlemen… Big congrats in advance for your incredible astro-scientific contributions, efforts… I am sure your efforts will result in incredible findings, and a big financial bonus and great perks after all of your sign-out paperwork has been finalized!!! Safe journey and thanksfor all you have shown us earthlings. incredible. well done. safe trip! Been watching your story on the station here in Scotland, the year has flown by! Amazing achievement Scott. Hello Scott, safe trip home. How do feel about returning home after 1 year in space? Do you think it will be difficult to adjust to have your feet on the ground? I admire what you have achieved. Well done, you should be proud. I am a retired citizen of the UK watching the mission all the time. Enjoy your trip back home with a soft landing! I have enjoyed your lovely photos. I am looking forward to the comparison results with your twin. I hope it doesn’t take you too long to learn how to walk. Good wishes to all of you. It’s been fascinating sharing in your journey. Have a safe trip back down to us. THANK YOU for what you just accomplished for mankind. Scott’s pictures have been inspirational. Safe travels sir! You’ve done a great service & following your year in space everyday has been a source of hope & inspiration as I struggled through a year of cancer diagnosis, treatment & recovery. Safe journey home. One piece of constructive criticism though. Could NASA consider getting rid of those formal folded collar shirts in space? They look ridiculous floating around like that. Maybe borrow a collar style from Star Trek or something? I can’t imagine how long it will take you to get pass the fact you won’t be able to float whenever you want to. What you’ll feel will remind me of how cool it felt getting my land legs after sailing and the great rhythm of sleep on the water. You might need some major customization from Disney to despise a pod in your home to simulate some of those sensations. What a wonderful experience and I wish you safety and a great mental adjustment with grace and was when you return home. Thank you for your service for humanity. Can’t wait to see you back on Earth safe and see what we can learn from your amazing, selfless, living experiment. Well done and safe re-entry later today! Godspeed, Cmdr Kelly! You’re an inspiration to humanity! Hero of the heroes. Bravo…. Safe return to you and all your fellow cosmonauts and thank you all for your bravery and work. You handed off to a good man!! My cousin Tim Kopra!